Whether it is snorkeling, bird watching, art collecting, or learning the secrets of Jamaican cuisine — our friendly staff will help arrange your personal adventure. Jamaica’s first inhabitants called their home “the land of wood and water.” Come discover the treasures of this island paradise – by foot or fishing boat, mountain bike or glass-bottom boat. We’re on board – you lead the way! For even more ideas, visit two of Jamaica's finest vacation planning websites; or check out some of our favorite island activities below. Experience total relaxation as you glide down Jamaica’s tranquil White River. Just a short scenic drive from Hermosa Cove you and a companion board a thirty-foot bamboo raft. Your guide poles you through groves of whispering bamboo as exotic birds sing. Think of it as a Jamaican Gondola ride. At picture-perfect Reggae Beach, lounge chairs line the seashore and cluster under almond and palm trees. A large bamboo bar offers exotic cocktails, and the seaside restaurant serves tasty local cuisine. Located 20 minutes from Ocho Rios, James Bond Beach is surrounded by crystal clear water on three sides and lush mountains on the fourth. The beach gets its name from nearby Goldeneye Manor where Ian Fleming wrote the James Bond novels. Home to the Moonraker Bar & Grill, where local fishers sell their daily catch, the beach also hosts concerts such as the Bob Marley Tribute. The beach at Margaritaville, christened by Jimmy Buffet himself, epitomizes island life with its sand volleyball court, water trampoline and Parrot Head party atmosphere. If your idea of island life involves peace and tranquility, nearby Mahogany Beach offers a pretty strip of beach with a small admission fee, good swimming and fine snorkeling. Just minutes from the resort, Blue Hole is unspoiled Caribbean beauty at its finest. Gaze over a cascading mountain waterfall, or cliff dive into the gemlike pool below. The dazzlingly blue waters offer a tranquil family destination far from the madding crowd. An exhilarating all-inclusive all-day bike tour through what the New York Times calls “one of the best scenic vistas in the Caribbean” – and you don’t even have to pedal! (Well, maybe 5% of the time.) The bus ride into the Blue Mountains stops at historical sites, outdoor markets and an open-air restaurant for brunch. From the 5,600-foot peak at Hardware Gap the descent winds through a lush tropical rainforest past cascading rivers and coffee plantations and concludes with a refreshing swim in a secluded mountain waterfall. A spectacular way for the outdoor enthusiast to take in the heart of Jamaica. 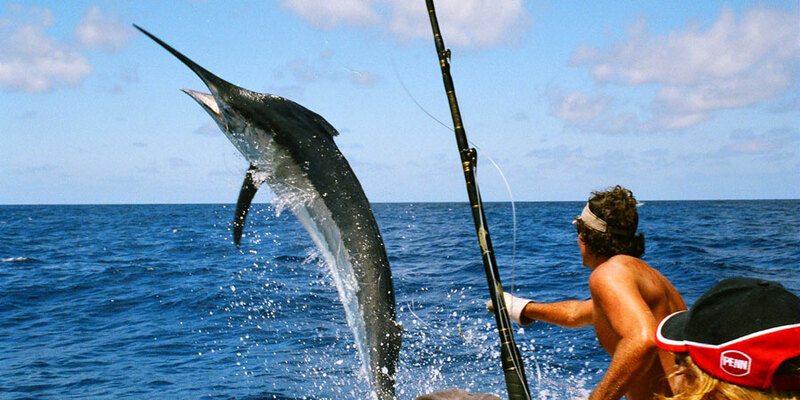 Grab a pole and head for the open seas on an authentic Jamaican fishing boat. Expert local fishermen will guide you to their choice spots for sport fishing. Bring along your waterproof camera – you’ll want a picture of that prize yellowfin tuna, sailfish, mahi-mahi or even marlin! Swim with bottlenose dolphins, encounter a shark (under careful supervision, of course) and interact with stingrays – all in their natural habitat on Jamaica’s picturesque North Coast. Admission includes snorkeling, beach access, jungle walks and glass-bottom kayak tours. Dolphin Cove is one of Jamaica’s most popular attractions so we recommend making reservations well in advance. Many people consider climbing the 600-foot waterfall at Dunn’s River a “must do” Jamaican adventure. Thousands of visitors and locals (ages seven and up) grab their waterproof camera and don swimwear to climb this stunning waterfall that empties into the sea. A 1500-meter labyrinthine cave with numerous stalactites and stalagmites. 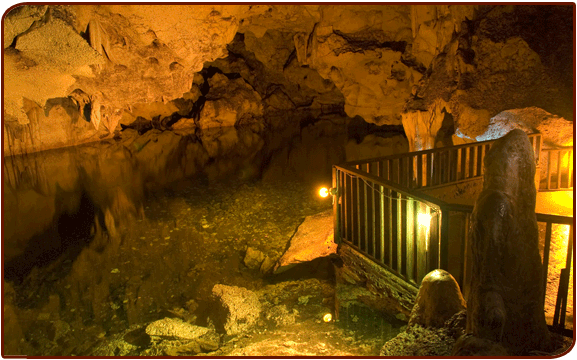 Explore limestone chambers illuminated by porous light holes and the subterranean Grotto Lake. The caves have a fascinating history, from the ancient Arawaks who left behind pottery fragments to the Jamaican government that stored rum here during the Second World War. Ride horseback through natural wetlands shaded by almond and coconut trees – then dash into the Caribbean to swim horseback through the waves. Chukka Cove, voted the “Carbbean’s best adventure tour operator,” also offers a low-key horticultural tour, catamaran-based snorkeling and a backcountry dune buggy ride. Skimming the Jamaican coastline, soaring over verdant mountains, peering at tropical fish through clear waters – it’s the experience of a lifetime. 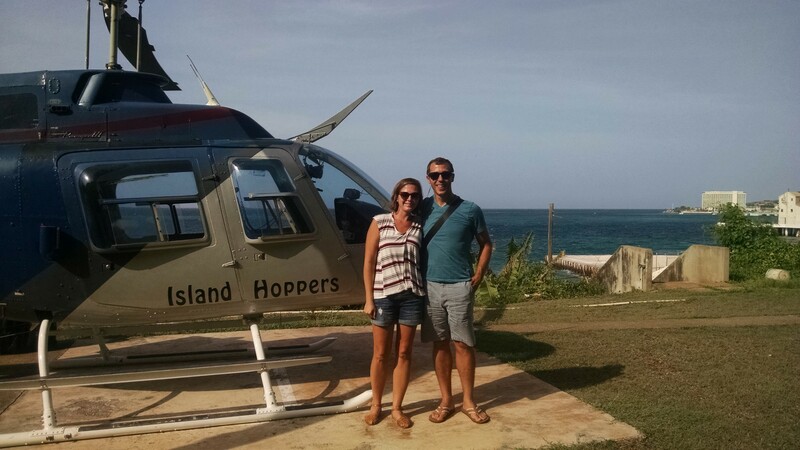 Captain John’s Island Hoppers offers a variety of tours including James Bond’s Jamaica, Memories of Jamaica and the island-spanning Jamaica Showcase. A first-class way to take in sights like Dolphin Cove and Goldeneye Manor while avoiding the tourists. Want to make your flight romantic? Let us chill a bottle of champagne for the ride. One of the top-rated attractions in Jamaica, Rainforest Adventures offers something for everyone: an exhilarating bobsled ride down the famed Mystic Mountain, a SkyExplorer ride with soaring views of the coast, a zip line tour through the rainforest canopy, an infinity pool and fine dining overlooking Ocho Rios bay. 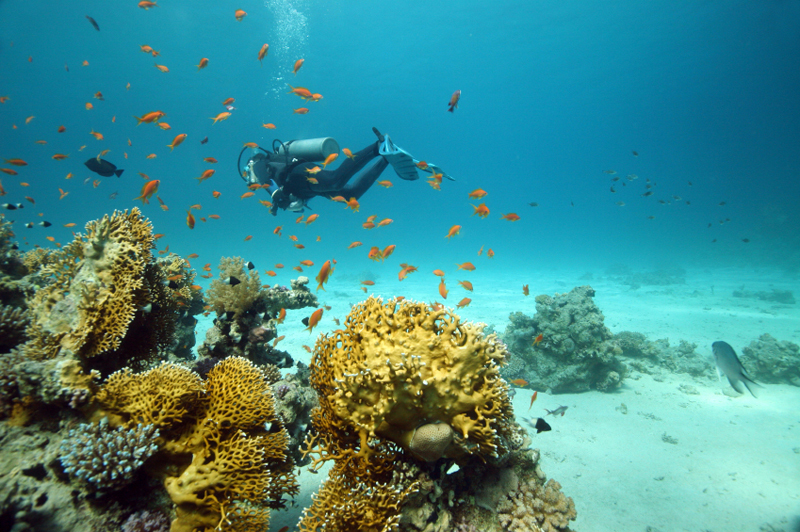 Experienced diver or scuba novice? Let us arrange the perfect trip for your experience level. A five-star PADI-certified dive team can guide you to the best underwater sites in Ocho Rios and Runaway Bay. Expect to encounter plenty of the area’s abundant marine life, including barracuda, spotted eagle rays, sea turtles, sponges and even dolphins. Drive through the hilly interior of Ocho Rios to the 17th-century Spanish Bridge where your expedition starts. Experienced guides will take you on a breathtaking three-mile journey down the White River on the border between Jamaica’s most beautiful parishes, Saint Mary and Saint Ann. At Hermosa Cove, we delight in sharing the best of Jamaica. This land is infused with pride, steeped in history, and driven by food, art, and music. Come savor pimento-smoked delicacies in an authentic jerk shack. Make a pilgrimage to Bob Marley’s birthplace. Stumble across 400-year old artifacts at the Rio Nuevo battleground. Then dance on the beach to a tropical island beat. For even more ideas, visit two of Jamaica's finest vacation planning websites; or check out some of our favorite cultural activities below. Spend a day on another of Jamaica’s pristine beaches and perhaps try your hand at surfing. Famous throughout Jamaica as the birthplace of jerk. Nowadays the roads surrounding Boston Bay are lined with jerk stalls. Located by a restored 18th-century sugar mill, Cranbrook Flower Forest is highly acclaimed for its scenic gardens, fountains and trails. Test your knowledge of exotic flora or just revel in a sea of color, surrounded by flourishing orchids, red euphobia and strutting peacocks. Visitors to Crankbrook can play croquet, ride donkeys, and take a zip line tour of the canopy. 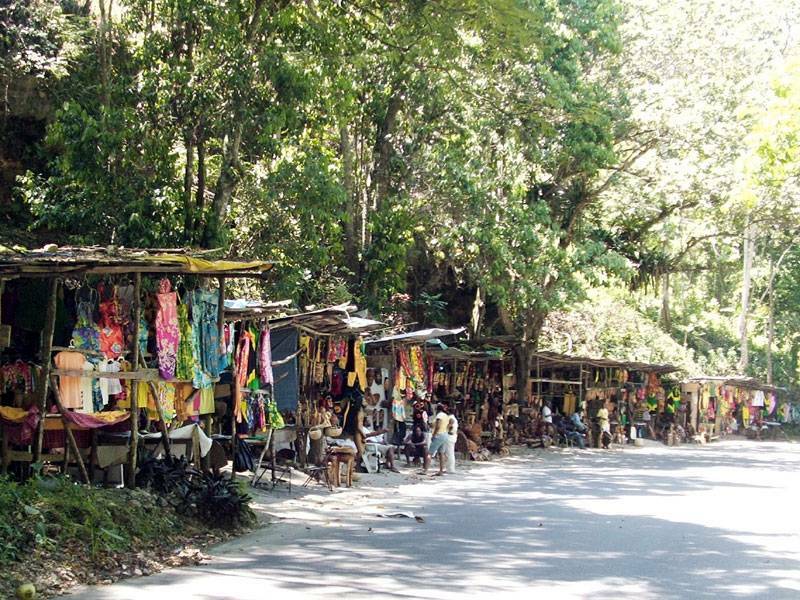 Jamaica’s favorite travel stop is humble strip of vendors along the road that winds down Mount Diablo. 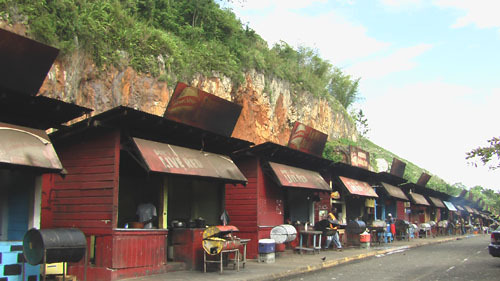 The row of neat stalls, set against a backdrop of brilliant red earth and bright green mountains, exudes vitality, with loud Reggae music pulsating and the smell of roast breadfruit and jerk smoke in air. The range and choice of foods, coupled with the welcoming smiles of vendors, reminds one of just how special Jamaica is. Nature enthusiasts will enjoy Fern Gully, a three-mile stretch south of Ocho Rios populated by 300 species of fern. The winding road follows the course of an ancient river that was destroyed in 1907 by an earthquake. Stop at booths along the road to browse for handmade jewelry and local art carved from lignum vitae, one of the hardest woods on earth. Couples Sans Souci offers a traditional gym with an exceptional view of the ocean. After working out with weight and cardio equipment you can relax in the sauna. Let our front desk know a day in advance if you want to schedule an early workout. Shopping, dining and live music can be found at Island Village. Stop in at Margaritaville, Jimmy Buffet’s local restaurant, to play sand volleyball, soak in the hot tub, or enjoy a pool with a swim-up bar. Spend a pleasant evening browsing the many shops for local art, jewelry, and souvenirs. Set in the lush hills of Saint Ann, H’evan’s Scent has zip lines, ATV tracks and the only licensed paintball field in Jamaica. Paintball enthusiasts will appreciate the top-notch equipment and large selection of playing scenarios. Three ATV tracks cater to riders of all abilities (ages six and up). Yaaman Adventure offers tours through fields of cassava, sugarcane, coffee, allspice, banana trees and other crops in their natural element. Tours include stories about the colorful history of the estate, which includes one of the oldest fortified great houses in Jamaica. You can explore the plantation by horseback or take a camel safari. Yes, a camel safari. Dining is one of the best ways to experience local culture. Locals and tourists alike frequent Scotchie’s in Saint Ann’s Bay for their signature jerk chicken, jerk pork, festival and escovitch fish. For a casual lunch or dinner, drop by Miss T’s in the heart of downtown Ocho Rios. This open-air restaurant serves all of the local favorites and has fresh daily features. Thirsty? Try the rum punch. Up for a late dinner and drinks, maybe some dancing? John Crow’s is the happening spot in downtown Ocho Rios for dance music on weekend nights. Vegetarian? That alone is reason for a trip to Jamaica. Many Rastafarians eat a diet known as “Ital,” which derives from the English word “vital.” The first syllable has been replaced by “I” to signify the unity of the speaker with all of nature. You can find fresh Ital creations for breakfast and lunch at The Healthy Way. Whatever you crave, we can recommend a restaurant in Ocho Rios to dazzle your palate. 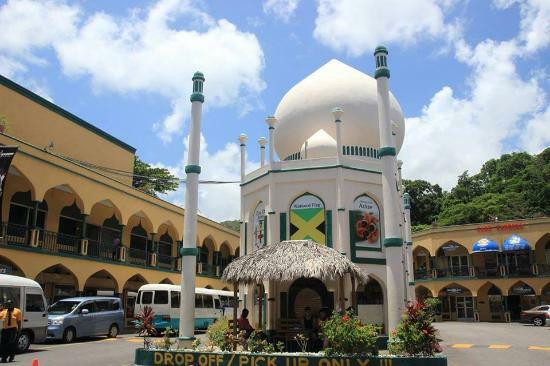 Transportation is available to Evita’s, Toscanini, Spring Garden, the bustling Ocho Rios Jerk Center, the vegetarian oasis Stush in the Bush, and anywhere else you care to dine. Rio Neuvo is the site of the final pitched battle between the British and Spanish in 1658. A fortified great house now contains remnants of the many peoples who have called the island home, including the Tainos, Spaniards, Africans and British. What makes this site extraordinary, however, are the historical artifacts that wash down the limestone cliffs during each rain. An attentive visitor may come across wooden mustache brushes from the early British Empire, shards of 16th-century glass bottles, and even stone-age scraping tools. Nestled among verdant hills 700 feet above sea level, Sandals Golf Course is one of the most scenic locations in Jamaica. Narrow fairways have been resurfaced with Bermuda grass, while miniscule, drop-off greens have been rebuilt with Tifdwarf Bermuda grass for a beautifully manicured course. 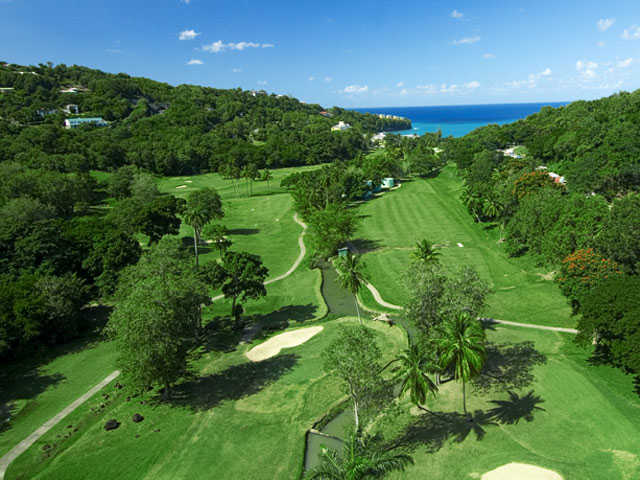 One of the finest golf destinations in the Caribbean, Golf Digest gave Sandals, Ocho Rios, a four-star rating. Situated on a hilltop overlooking the azure Caribbean, Shaw Botanical Gardens embrace 25 acres of tropical splendor. A sparkling waterfall cascades down a rocky course with luxuriant plants on all sides. Lush tropical trees form bowers with flamboyant blossoms every month of the year. These two outdoor centers are the best places to shop for arts and crafts, jewelry, souvenirs, and gifts. The Tortuga rum cakes found in many shops make a wonderful gift to bring home. The downtown craft markets are just the place to practice your haggling skills – or let our experienced local guides get you the best price. Built in 1960 by British Naval Commander J. Harris, Superclubs has long rolling fairways and large greens guarded by sand bunkers and grassy mounds. The course has hosted championship events including the Jamaica Open and the World Cup of Golf Qualifier. Players of all skill levels can enjoy this golf course and its scenic views.